Everyone knows the Great Wave. The print itself is the most reproduced image in the world – appearing on everything from pencils to coffee mugs, and street art to drums. And the wave is reused endlessly, to illustrate our vulnerability to the power of nature (and nature’s vulnerability to us), the storms of the global political economy, and the whims of politicians. 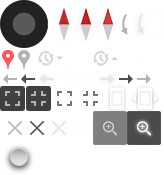 It has even been made into an emoji. But not everyone sees or remembers the other elements in the print – the mountain in the distance and the three boats tucked between the waves. And not many people outside Japan know the name of the artist (although possibly more do now thanks to the Museum’s current exhibition!). Katsushika Hokusai (1760–1849), Under the wave off Kanagawa (The Great Wave) from Thirty-six views of Mt Fuji. Colour woodblock, 1831. Acquired with Art Fund support. Katsushika Hokusai (1760–1849) was 71 when the print was first published. A few years later, though, he claimed that nothing he did before he was 70 was worth much, and it was only at the age of 73 that he had begun to understand the true form of things. Part of this was advertising, of course. He wanted you to believe what he was doing at that moment was his best work yet. And he wanted you to keep buying his work: at 110, he promised ‘each dot and each line will come alive’. 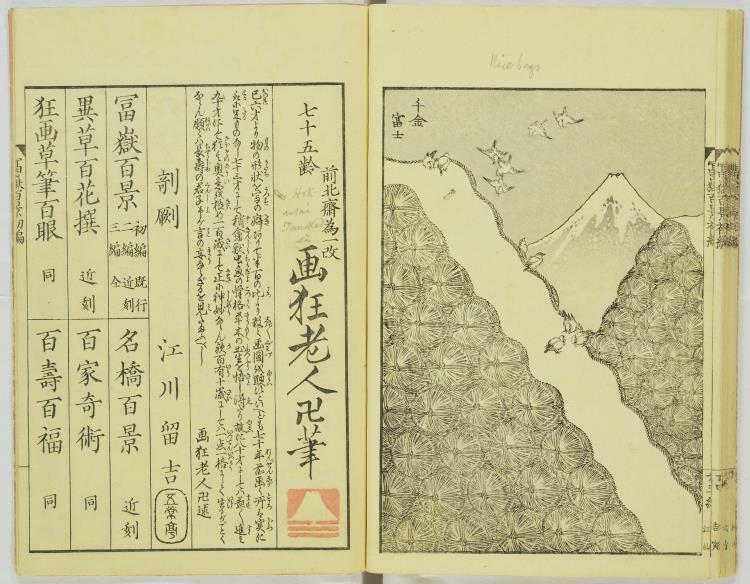 At the end of this book’s first volume, aged 75, Hokusai uses a new name, ‘Old Man Crazy to Paint’, and a new seal, incorporating the outline of Fuji. He also sets out his artistic ambitions for the next 45 years. 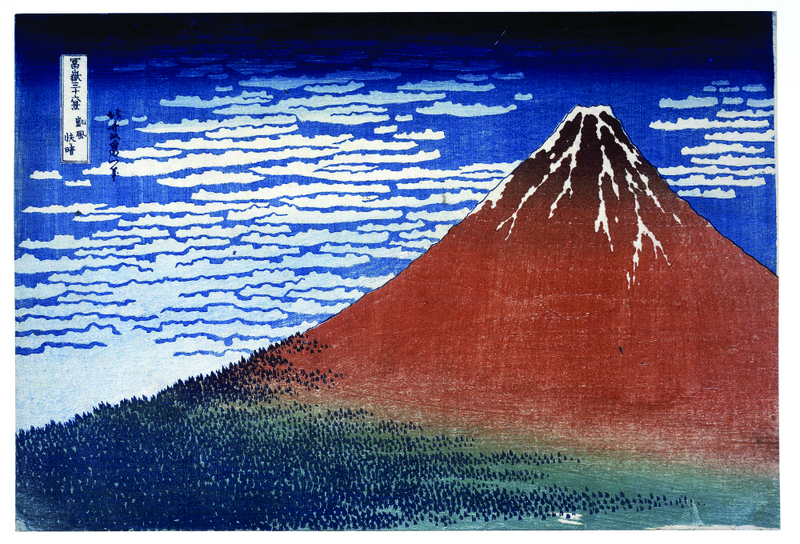 Katsushika Hokusai, One Hundred Views of Mt Fuji. Illustrated book, first of three volumes, 1834. He only made it to 90. But he kept on drawing and painting to the end. And he made good on his promise. The extraordinary results are currently on display at the Museum in the exhibition Hokusai: beyond the Great Wave. We want you to go beyond the Great Wave, which comes early in the exhibition, and to explore the magnificent worlds that Hokusai conjured in deep old age. We do keep coming back to it, though. It’s the Great Wave that headlines the exhibition. And it’s the Great Wave that seems to draw the crowds and to compel the critics. There are good reasons for this, of course. Hokusai’s work reached the west around 1860. Almost immediately, his manga (meaning ‘random pictures’) were seized on by the Impressionists, among others, liberating them from existing assumptions about how to draw and paint. It’s not too much to claim that modern art probably begins with Hokusai. Two decades later, the ocean was on western minds. The powers were using their ironclad fleets to expand their empires, not least across the Pacific. The Great Wave quickly came to symbolise the turbulence of the arts, as they strove to come to terms with the dislocations of industry and empire, appearing in Van Gogh’s Starry Night and illustrating the sheet music for Debussy’s La Mer. 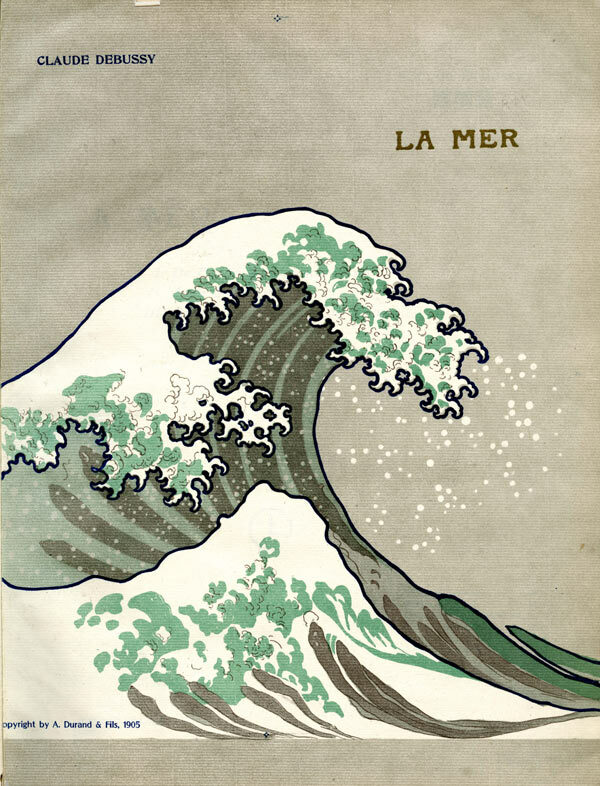 Claude Debussy, La Mer. Orchestral score, published by A Durand, 1905. And it has gone on to sweep the world. Again, there are good reasons. The print is a miracle of graphic compression and imagination. Hokusai has reduced the world to three elements: churning ocean, still, small mountain, and lowering sky. He has also revealed our place in it – the need to bend to the task, however dwarfed by nature, however uncertain the outcome. But our preoccupation with this one print also suggests a problem. When we look at art, we tend to see what we want. And we usually want a story that leads to us. In Japan, Hokusai is best known not for the Great Wave, but for the print known as Red Fuji – though the earliest impressions seem to have been pink. As the west turned to the oceans, so Japan had to find the internal resources and a national symbol with which to confront the threat. Katsushika Hokusai, Clear day with a southern breeze (Red Fuji). Colour woodblock print, 1831. 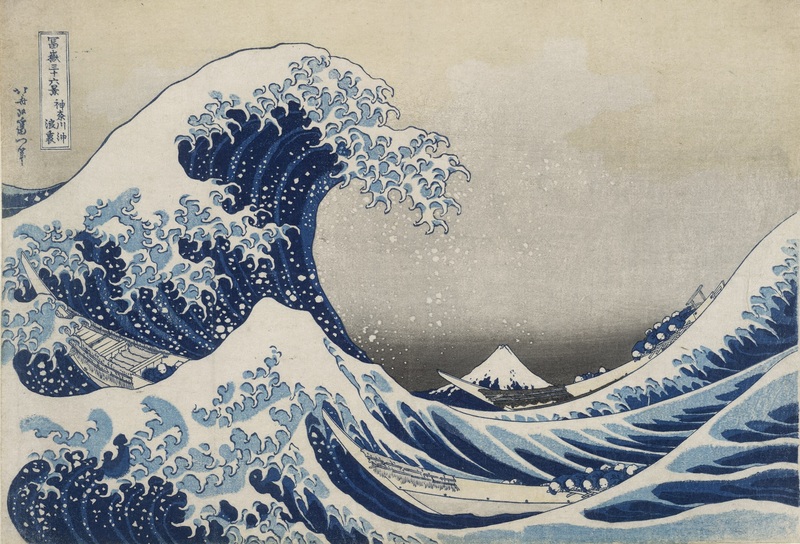 In the west, the first instinct is to reduce the Great Wave – and Hokusai – to its influence on western art. We think we know that the west led the way into the modern world. We are confident that the way in which we look at western art is the right way to look at art in general, and so we write Hokusai into the story of art on our terms, without questioning our assumptions. It turns out, too, that Hokusai had studied western art – specifically, the way in which perspective drawing creates the illusion of depth – and that he incorporated these lessons into the Great Wave. Knowing this, we might be tempted to reduce the Great Wave still further, to a Japanese variation on a dominant western theme. Here, though, is where we go wrong. Perspective was only one of many techniques that Hokusai had mastered in the first 60 years of his life and that he drew on in the last 30. More importantly, he was not interested in the preoccupations of western art – how to depict the world realistically – and he had no need to challenge the conventions for doing so. Rather, he wanted to bring the world to life. He wanted to explore the tension between the churning sea and the eternal mountain, between the seen world that surrounds us and the unseen forces by which it is animated. He was not interested in establishing a distance between viewer and viewed, so that the world might be represented accurately, but in enabling communion, allowing us to see our way to the heart of things. Look a bit harder, and Hokusai has much more to say. The Great Wave is not the greatest of Hokusai’s waves. He painted those up in the mountains, in his mid 80s, as the ceiling panels for a festival cart. You can find them toward the end of the exhibition. And they provide a fitting portal into the sublime paintings of his last three years, in the final room. Stamped with a seal announcing his determination to reach 100, they demonstrate how Hokusai could move effortlessly between seen and unseen worlds – even if we might want to keep the two apart. At 88, he shows us what it means to be a duck, floating on and ducking beneath the water, but also how a 12th-century warrior was able to fell a mythical monster. Aged 90, in the last few months of his life, he captures the burden, but also the freedom, that comes with deep old age. The most magnificent of Hokusai’s dragons – old, tired, but persistent – coils up out of the storm, bringing the rain that brings the world to life. A tiger pads effortlessly through the snow, gazing heavenwards, seeming to smile. 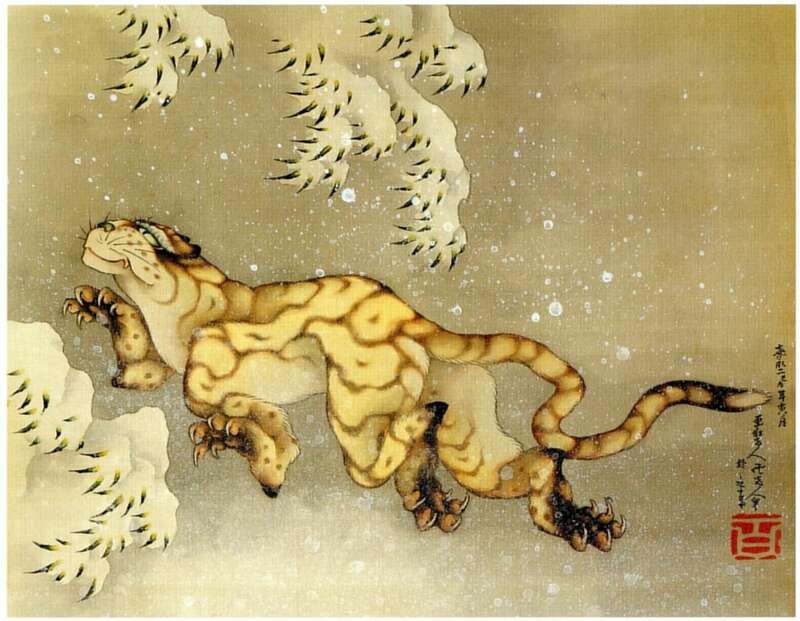 Katsushika Hokusai, Tiger in the snow. Hanging scroll, ink and colour on silk, 1849. Private collection, USA. It’s easy enough to see only what we want. But there’s always more to see with Hokusai. It’s worth coming back and taking another look. Hokusai: beyond the Great Wave is on display at the Museum from 25 May to 13 August 2017, supported by Mitsubishi Corporation. Tickets for the exhibition have sold out. The best way to see the exhibition is to become a Member. You’ll be able to access sold-out ticket slots and out-of-hours opportunities. Join online today or call +44 (0)20 7323 8195 on Monday to Friday, 10.00–17.00.